Chicago voters could soon be asked to more than double the tax on sales of million-dollar-plus real estate to pay for an ambitious new effort to reduce homelessness. A proposal backed by the Chicago Coalition for the Homeless, community groups and other advocates anticipates generating $150 million a year that would be dedicated to providing affordable housing and services for homeless individuals. An ordinance seeking to place a referendum on the Feb. 26 election ballot is expected to be introduced at next week’s City Council meeting. The referendum would ask voters to increase the city’s real estate transfer tax by 160 percent on properties that sell for more than $1 million; that would make the tax $9.75 per $500 of sales price, up from the current $3.75 per $500. For a home selling for $1,000,001, the increase would require the buyer to pay the city an additional $12,000 in transfer taxes. On the purchase of a $100 million downtown office building, the buyer would owe the city an extra $1.2 million. By targeting the tax increase at more expensive properties, organizers of the Bring Chicago Home campaign are hoping to win the support of average Chicagoans who would not be charged the additional amount. But the effort is expected to face major political opposition from real estate and business groups who see transfer taxes as a barrier to property sales and an added disincentive to business. Instead of arguing self-interest, however, the Chicago Association of Realtors will oppose the tax hike on the basis that wide fluctuations in annual transfer tax collections make it an unpredictable — and therefore unreliable — funding source for homeless services, said Brian Bernardoni, the group’s senior director of government affairs. Bernardoni also argued there is no guarantee the city won’t just take the money that now pays for homeless services and use it to pay for other expenses. Julie Dworkin, director of policy for the Chicago Coalition for the Homeless, said a reserve fund will be created to guard against revenue fluctuations. A provision in the ordinance will also seek to prohibit the city from using the new funds to supplant current funding, she said. If approved, the added funding would allow the city to launch a much more aggressive effort to stem homelessness. By comparison, Mayor Rahm Emanuel’s current city budget touts his commitment to invest an extra $1.1 million on programs for the homeless in 2019. The primary focus of the Bring Chicago Home effort will be to create permanent housing with support services to meet a goal of reducing homelessness by 36,000 households in 10 years, Dworkin said. Advocates say they have commitments from 31 of Chicago’s 50 aldermen to support the measure. The Emanuel Administration has not taken a position. The lead sponsor is Ald. Walter Burnett (27th), who has been at the forefront of most of the city’s major affordable housing initiatives over the past decade. Burnett said the dedicated tax would help bring Chicago’s efforts to fight homelessness more in line with other major U.S. cities at a time when the state and federal governments are pulling back support. Based on sales data from previous years, supporters of the tax say it will impact about 5 percent of all real estate transactions in the city. Under state law, voters must give advance approval to any increase in the real estate transfer tax. The requirement grew out of an aborted attempt in 1996 by the late Cook County Board President John Stroger to increase the county’s transfer tax by 15-fold. Stroger withdrew the proposal after a buzzsaw of opposition from home buyers and sellers. If voters approve the referendum, aldermen would still need to pass an ordinance to enact the tax increase, which would take effect July 1, 2019. 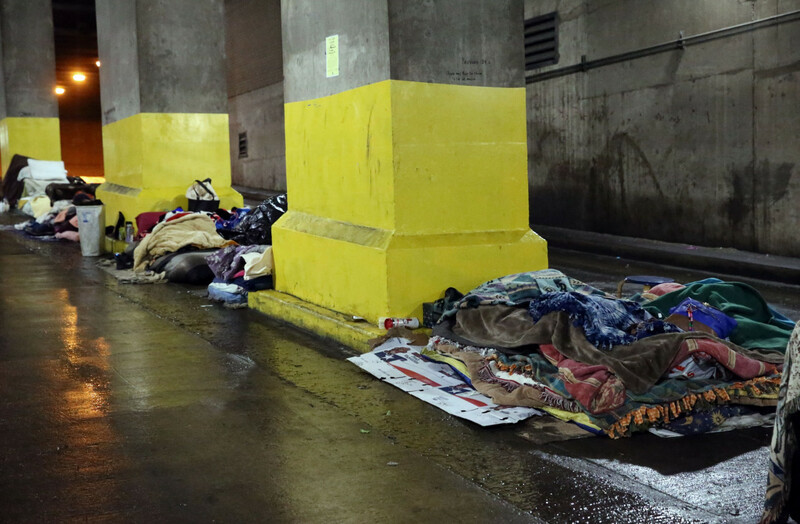 The city pegs the local homeless population at 5,450 individuals based on an annual count of people living in shelters or on the street on one night in January. That’s down from 5,657 in 2017. The coalition argues the true picture of homelessness in Chicago is closer to 80,000 people over the course of a year, counting those who live doubled up with family or friends because they can’t afford a home of their own.